Of all the hiking trails of Ames Nowell State Park this is the route that has eluded many. One reason being that Cleveland Pond has an irregular shape and a large island that masks the true shore line of the pond. The official trail map is old and hasn't been updated. There is no routing system in place and only recently any trail marking or organization of any kind has been put in place. There are more trails than what the map has to offer and some may travel over private property, but have been in place for many years. All this makes Ames Nowell a place that one needs to spend much time at to figure how to get around. This trail is a big one! 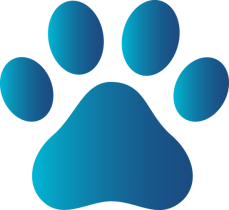 Please take the time to read the trail quick facts! 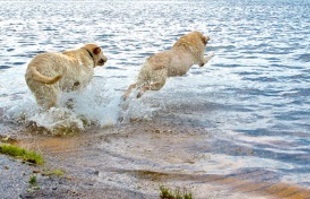 At one point there was no actual way to get all the way around the pond, though some did know the way. Trail work has been done in the last few years making it possible. Here I will explain how to get around from the much used eastern side to the western in a counter clockwise fashion. Though I may write a guide in the opposite direction now that newer park trail markers are up! 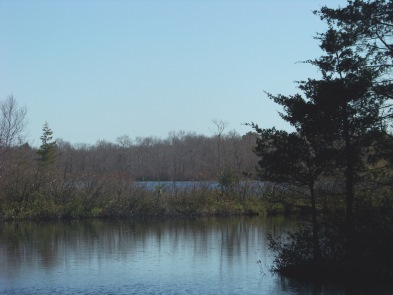 On the revised trail map on the main page called Hiking Trails of Abington, the Around Cleveland Pond Trail uses the trails marked in blue and then red to lead around the pond entirely. 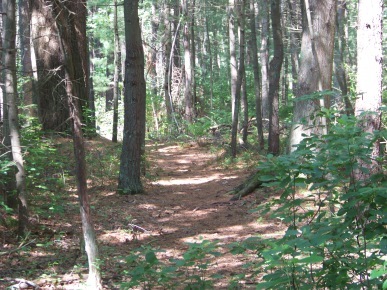 Start, by accessing the dog walk trail and following that trail guide till the clearing at the picnic table and bench. At this point you will have already hiked one mile. The guide will tell you to go left (as you are standing and turned around at the picnic table facing back toward the way you came in). The trail is actually on the right but not easily seen. 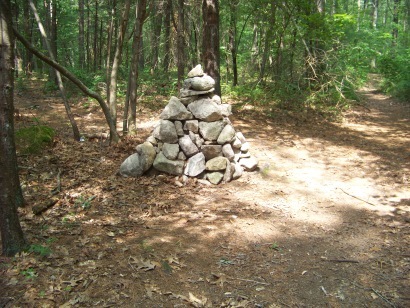 When you initially make your way down the Dog Walk portion of the trail you will find a marking of E07 at a more noticeable trail that is bordered by a stone wall. This particular trail however goes to Hancock St. not around the pond. The trail continues like much of the first part of the trail in an easy cart path style. 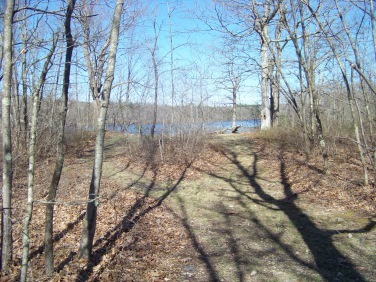 Along this portion there is a short trail to the left that goes out to a view of the far end of the pond where bird houses have been built. Soon after you will see a rock pile cairn on the left. You will take this left on a narrower trail. Except in winter when it is frozen and nicer looking! 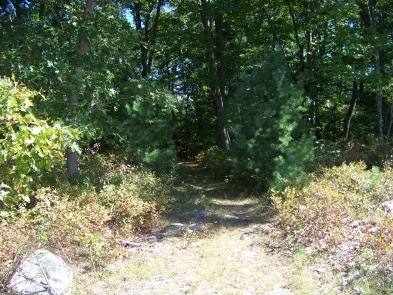 From here the trail climbs into a wooded area with a pine stand. After this, it once again leads down to water. This time to Deacon Brook. No formal crossing just a choice. crossing. This crossing seems to have been worked on recently. when getting across wasn't so easy! sure footing across the brook is in place! 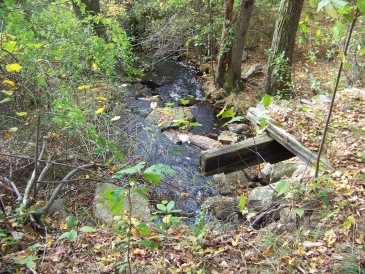 Once across this stream you will climb up to the Richards family grave site. The trail becomes a bit grassy here. The trail splits again with the around Cleveland Pond hiking trail going to the left on a very narrow trail that is easy to miss. Going straight on the cart path trail here will bring you behind houses on Chestnut Street. 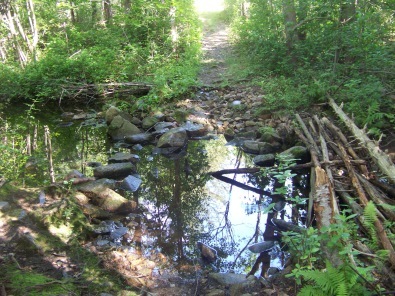 It eventually leads over a small bridge that crosses another part of Deacon brook. The trail ends on a lot next to a house on Chestnut St. Taking the left on the narrow trail of the Around the Cleveland Pond Trail will bring you through an interesting bit of forest. This leads to a left again on a trail that widens out to a cart path. This cart path intersects with the original path that leads out to Chestnut St, yet in times past it had become overgrown. It has been cleared again making the way around more accessible. Lots of trail work has been done! This bridge is in need of repair. be working in this area. 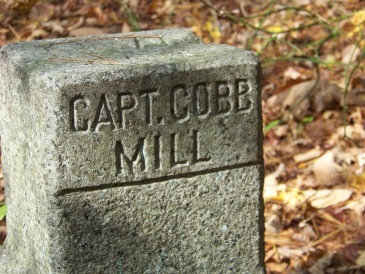 At the side of the brook is where this marker is found. Next on this hiking trail is the top of the pond. 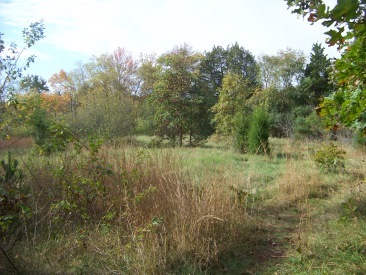 The trail runs through a meadow. In the summer the grass here is quite tall. through the grass and back into forest. 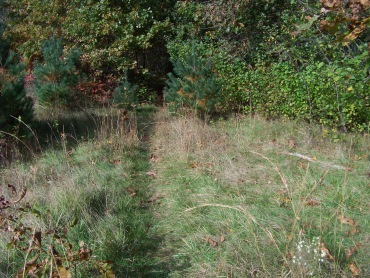 The trail then follows around the outskirts of the meadow in a thicket that has been cut through. This is where the newer trail work is. I had been out here years before but had never seen a trail. At the end of the thicket the trail turns right and over more water that previously had only primitive crossing material to make your way across but has recently been updated with a small bridge. 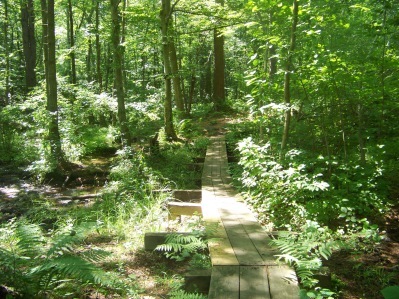 Once over the water the hiking trail follows through more forest and easy trails. 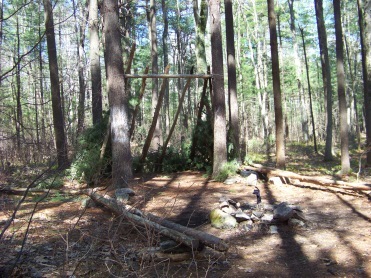 At 1 3/4miles it comes upon a place that those well acquainted with the forest have used to "camp" at. Who ever uses this area keeps it nice and tidy. A refreshing sight from what I usually find at spots like this!! almost a harbor from the main pond. 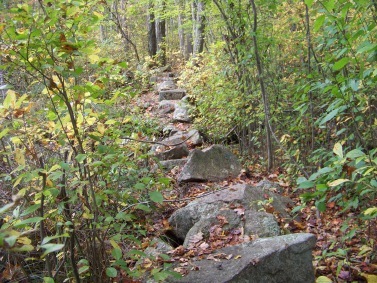 Soon after the trail becomes narrower and through an area that had previously used a rock wall as part of the trail to lead through the forest. Again newer trail work, now the stone wall has a bridge built next to it. I enjoyed the rock wall as a rustic feature of following this trail, but I suppose it is better and safer for all that the bridge was built. powerlines and another leading to the western side boardwalk. 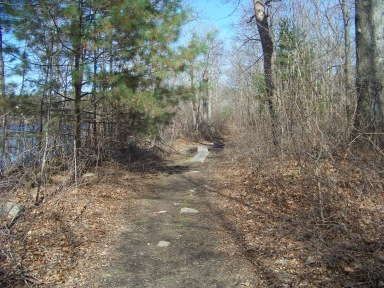 The Around Cleveland Pond Hiking Trail is long. In it's full circumference with short cuts it is at least 4 1/4 miles. The full length is 5 miles. At this point you will have hiked approximately 2 miles. This is a good cut off point to cut this hike in half. Once out to the power line taking a right will lead you down to Chestnut St. If you plan this ahead of time, leaving a second car at the power line entrance or side of the road on Chestnut st will make this hike something anyone at any hiking level could achieve. The side trail that leads off to the left to the boardwalk can be hard to follow and fades off a bit. It is a narrow path that needs to be marked as it is the best way to the boardwalk on this side of the park. It leads up and over a couple of outcroppings. After the second one it seems disappear. It then leads up a rise in the land that appears to have been built in former times. 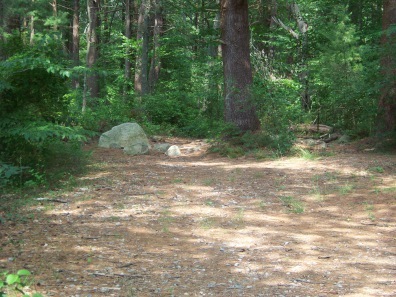 This area that the hiking trail seems to disappear has a stone wall to the left with a large opening. 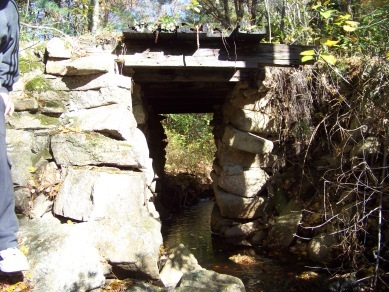 One can imagine that this was used formerly as a colonial way for livestock to pass through? Or maybe this was the site a yet another mill? Once you pick your way up the rise you will see the trail continue on toward the left, after it takes a short turn on the top of the rise to the right. 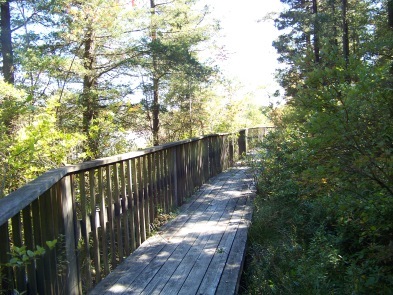 This narrow path will connect with a broader path that will lead to an end at the water if following left, but turning to the right will lead to the boardwalk. then picking your way out to the power line is best. take a left and continuing on the utility road, pass by one utility tower and if you notice very carefully on the left you will see the barely evident path to the other boardwalk from this side. 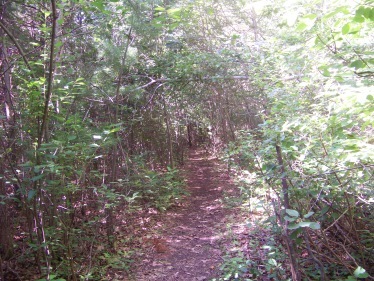 It is a worn path through grass and low shrubs. It lies between a rocky rise and the wetland area. Once across the power line and back to the forest it becomes much like any path through the forest. If you don't really "see" the path, just cross the power line through the scrub. The path into the forest should become very noticeable. 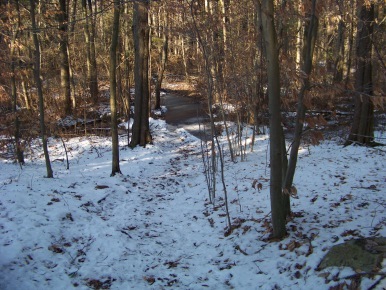 If you have followed the trail through the forest, this same path will be used to exit and continue on along the Around Cleveland Pond hiking trail. At the boardwalk you will find a marker W35. This is the 2 mile mark on the trail. This boardwalk is like the other with a railing on the side and views of the water. The area at the end could use some trail work. The boardwalk does not stretch out to the shore. It ends with a path leading out, but over growth and ever present water makes the journey difficult but not impossible. To continue along on the trail you will need to follow the trail back out to the power line and turn left. At the top of the road where the power line meets the water another trail will appear on the right. 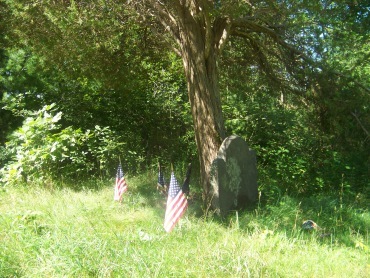 Continuing on the hiking trail, you will find yet another marker W34 at the start. It will start very sandy and turn once again into a cart path type trail. There will be a light incline here strewn with rocks. Views of the pond will open up on the left. The down the hill portion will be steeper and the trail comes to a portion of wet area. Here many mistakingly believe the trail leads through the wetland. It may have done so previously, and at other times I did use that way. The trail now takes a wide sweep to the right skirting around this wet area. 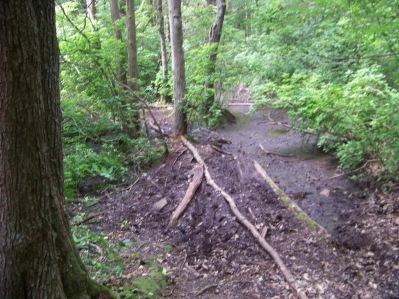 It is actually hard to stay on the actual trail at this point, as many have made "alternate trailwork". 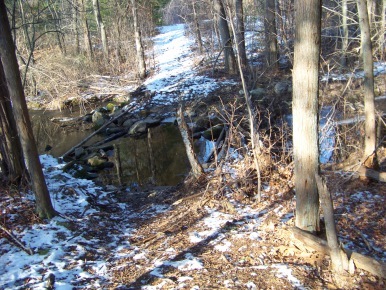 It takes this turn to the right and appears to lead away from the pond shoreline. You will come to another left which another alternate, but not the trail. You will come to another "intersection" where the trail DOES finally take the left but your attention will be to the seeming trail to the right along the large rock outcropping. Someone has attached a bright pink marker around a tree here to bring the left to your attention. After this left you will find stepping stones along the trail to help in wet weather. Once past the stepping stones the path leads through two large stones and out to a cart path. Take a right to continue. This area of the forest is quite rocky. The cart path is easy stepping but a fair amount of rocks strewn along it. The trail will soon get rockier and up an incline and come to another intersection. The cart path leads to the right and will lead out to Chestnut St. There will be a narrower path to the left. The Around Cleveland Pond hiking trail takes this left. There are actually two trails that lead to the same area. The 2nd left along the cart path may also be used and takes a trail along higher ground. Both eventually lead out to another intersection. Taking the first left the trail leads down toward the water becoming considerably rocky. It then evens out and easier to navigate. Thereafter the intersection with the higher ground trail will emerge. Both lead down to an intersection with W28 which goes uphill. The trail continues straight and comes to the intersection of W28 which goes uphill as well. The hiking trails above that W28 are fairly extensive, a bit more rugged and can lead out to North Quincy St on the Abington / Brockton line. At three miles the Around Cleveland Pond trail then turns left over an extensive low boardwalk over wetland. major highlight of this hike! 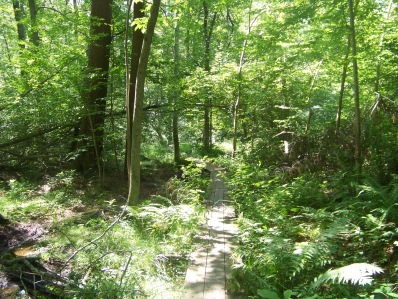 This boardwalk is separated by areas of land with trail intersections. After the first the trail leads a bit to the left, another land intersection and a third section of boardwalk. The hiking trail once again becomes a cart path and eventually becomes more road-like. has a high multi use. Area residents sometimes use this way to access the power line roads with ATV's and dirt bikes. Heightened awareness should be heeded here! Once to this road you will take a left. If you have done all the hiking you want to do at this point, following the road out to the powerline is the shortest way back into the eastern portion of the Park. Though the short cuts only chop 1/2 mile off of the full length. After taking the left the roadway comes to an area that is always water filled but the road goes around it. There will be an intersection of sorts with an island in the middle. If you want the shortened version of the trail stay to the right and follow the road out to the utility road taking a right. If you want the full excursion, then take the left at this island. It was at one time marked by an orange arrow but has faded with time. This will once again take you close to Cleveland pond and an area that the swans like to take refuge at. This trail was a true hiking trail size but trail work has been done making it wider and easier to find. It will lead you out to the power line close to where the lines extend across the pond and across from where you previously were at the other boardwalk. Once out to the power line the Around Cleveland Pond hiking trail takes a right. You will soon find your way to the shortened route area where the road comes out to the power line. Follow this road down. 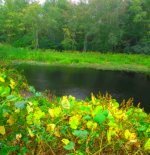 It takes a sharp turn to the right and views of the pond open up through the forest. The road will make an intersection by one of the towers and looking to the left you will find a gate to the eastern side of the park. At this point you will have hiked 3 3/4 miles if following the shorter route. Again if the hike has been too long you can follow straight on the trail ahead. Notice the many paths leading to the right on the way. These follow into the Beaver Brook Conservation Area. This main trail will follow out to the main park area where you can cross the bridge and follow the first road on the right out to the parking lot. 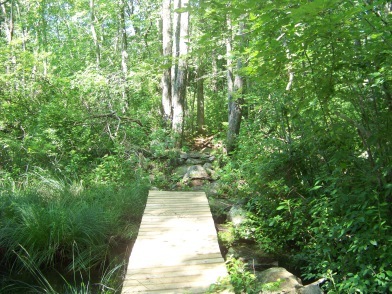 If you want to follow the Around Cleveland Pond hiking trail in it's true form taking a left at the first intersection upon entering the eastern side of the park after the gate will bring you back near the water and the eastern boardwalk. to the area with the large rock and bridge. Again follow over the bridge and taking first right will bring you back to the parking lot. on the eastern side of the park. There is a comprehensive map of Ames Nowell on Maprika! As well as several other south shore areas and more. Get the app at App Store or Google Play. The map can be downloaded right to your smart phone. From Boston heading south on route 93 to route 3 at split, take exit 16 south on route 18 approx. 5 miles. Take right at intersection of route 139 (West). Take 2nd left on Lincoln and follow to end with a left on Hancock st. Take 2nd right on Presidential Dr. following to end and right on Linwood st. State Park is on the end of Linwood. The around cleveland pond trail starts at the half way point on the dog walk trail. Regular parking lot that can accommodate many vehicles. Extensive; ( 2 1/2-3 1/2 hours) As many as 5 miles! Because of the length of this trail a bit of planning is highly suggested. Good supportive boots, water and snack food should be carried. Other long hike planning ideas can be found on the hiking tips page. If a 5 mile hike is beyond your capability this can be broken in two (with an additional vehicle). Parking at the power utility road on Chestnut St. is an alternative. (Following the directions above to the park, when reaching Hancock St, instead of turning left make a right and follow to the next intersection. This will be Chestnut St. Take a left. The utility line is approximately 1/2 mile away. Many park along side the road here to access this part of Ames Nowell.